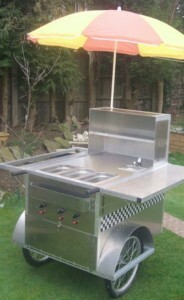 These American New York Hot Dog Carts have been made to be light, manoeuvrable and have loads of storage space. It has a large pneumatic caster wheel at the front so is great in muddy fields and two large lockable compartments. It has THREE SEPERATE BURNERS a feature no other cart will have; this means you can easily control what you want to cook such as Dogs, Chilli, Onions, Soup whatever. Each burner has a separate igniter and flame failure device so the cart is safe to use indoors. The two collapsible shelves provide extra work space and display space on the right, with the left hand shelf able to take 6 x 1/6 dishes or 3×1/3dishes as shown for the extras such as tomatoes, pickles, onions etc. The minimum hire period is 120 days, however we will consider shorter periods subject to terms. To arrange a confirmed booking, we will email the client our contract on request, which should then to be returned to us within seven days completed with all data requested and a £800 booking fee. Hire to start with three weeks of signed contract. Hire rate is £75.00 per week Hire payments are weekly in advance by BASC or standing order. 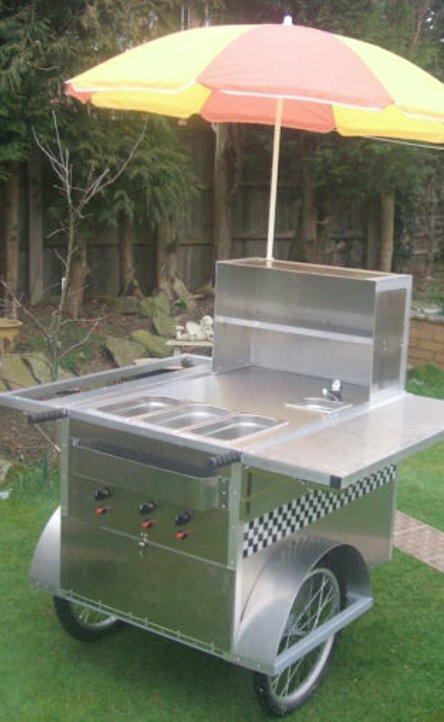 For any short term hires, all hire rates to be paid in full before hire starts The hirer is responsible for insuring the Hot Dog Cart to the full value of £2 800 plus any costs. The client can arrange to pick up from CTH yard at a agreed date and time, and make arrangement for the return of the Cart to CTH. At the same time we will show the client how everything operates . The client may also request us to deliver and setup on site at a agreed date and time, and make arrangement for the return of the Cart. This service we charge for, and the cost depends on the distance we have to travel.